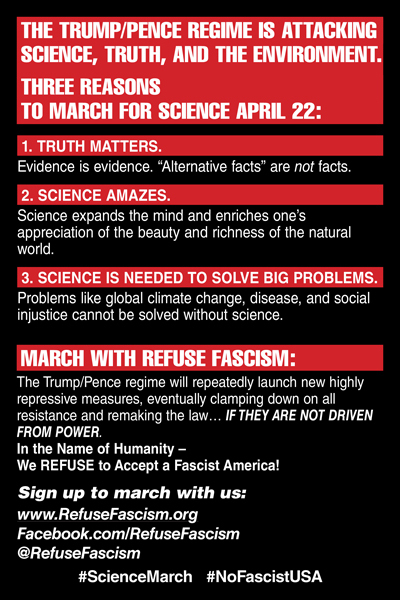 Because it is clear in my mind and the minds of most scientists that the Trump/Pence administration has launched a war against the use of scientifically supported empirical data on nearly every relevant issue (climate change, clean environment, clean water, and many more), the March for Science must recognize and loudly proclaim that the very reason it is taking place is the fascist regime that came to office with the last U.S. election. On April 22, I will be marching in the Refuse Fascism contingent in Boston, not because it was the first to recognize the ascent to power of a fascist regime, although indeed it was the first, but because it led in the recognition, in such a clear-eyed blunt manner, of what humanity needed to do in this part of the world to put an end to this regime. It is because they not only have fought for the need to drive this regime from power as the solution, but explained, in an ongoing way, why this is necessary, as most difficult as this may be, and why it is also possible. Through their website and television appearances, I have learned a great deal about a subject that I thought that I had known quite a bit about only to realize that in this day and age it has slipped through to the fore in a different manner. It looks different but is essentially the same in content. The ugliness of the hatred could have been mistaken for simple white supremacist banter that suddenly has the reins of power in the White House, as true as that most definitely is, but Refuse Fascism has raised the alarm that this is not just that but something much more sinister, the rise to fascism. The calling out of the regime as fascist has alarmed many and caused many to confront the moral issue of the generation specifically “what am I going to do about it?” Refuse Fascism has put forward the plan and realization that we all have to act and act outside of the normal institutional framework if we are to have a chance at driving them out and preventing the consolidation of fascism. This organization has brought out the nature of “normalization” that occurs during fascist consolidation of power, what this “normalization” looks like, what the effects of “normalization” are, and what are the consequences if we allow “normalization” to take hold and bring our guard down. More than anything it has approached this whole problem from a scientifically correct position, and that is that it is helping us all to realize we should, correctly, be operating from the vantage point of all of humanity. Because that is what is at stake. All of humanity. Please join with me and others as part of this contingent as we demonstrate our determination to defend science against this fascist regime that has truth, scientific inquiry, and critical thinking in its crosshairs. Because science is under attack. Because science is the most important development in human history. Because we need to drive out trump/pence and all they stand for. Because we need to move forward in history, by the tens of millions, and not backwards.